Washington (CNN) In a dramatic ruling, the Supreme Court on Monday threw out a Texas abortion access law in a victory to supporters of abortion rights who argued it would have shuttered all but a handful of clinics in the state. The 5-3 ruling is the most significant decision from the Supreme Court on abortion in two decades and could serve to deter other states from passing so-called "clinic shutdown" laws. In joining with the liberal justices, perennial swing vote Justice Anthony Kennedy helped deliver a victory to abortion rights activists and signaled the court's majority in their favor could continue regardless of the presidential election and the filling of the empty seat on the bench left by the death of conservative Justice Antonin Scalia. Simply put, today the Supreme Court issued a ruling forbidding Texas from enacting health and safety regulations for facilities that end the lives of unborn children. Lovely, huh? Even that was "too much" of an "infringement" upon women's right, apparently. Then, right on cue, we have to see things that make our stomach turn even more. Unfortunately, we've been here before. Managing Editor for The Lutheran Witness, Adriane Heins, shared a recent experience she had that definitely relates to watch we've seen today. I won't soon forget standing on the steps of the Supreme Court the day the justices ruled on the HHS contraception mandate. I wasn't expecting the anger and hate aimed at those supporting life and religious liberty. But it was there, and it was real. The women on those steps were mad. They screamed at us. They yelled. They were red in the face. The vitriol was almost tangible. I imagine it wasn't much different today, especially hearing that they played Madonna's "Like a Virgin" and "We Are the Champions." So tonight, Chris and Georgia and I will pray, as we do every night, for those who hearts are hardened and bitter, for all children yet unborn and for their mothers, because the Lord really does hear, and He really is good and His steadfast love really does endure forever. As Rev. Alan Kornacki Jr. keenly observed, "It's ironic and sad that what has been called a 'living document' has been used as a tool in the brutal murder of over 50 million people since 1973." As if that weren't enough to make our blood boil, Mollie Hemmingway reported on the Washington Post's Kermit Gosnell denialism, which is equally disgusting . We Christians should already know that this is nothing but a modern day "Cult of Molech" we're witnessing before our very eyes. I mean, the parallels are indeed quite striking (Ecclesiastes 1:9)! This isn't the first time I've written about this subject either (I wish it were!). In fact, if you're looking for a comprehensive Christian (and distinctly Lutheran) commentary on the topic, then I strongly encourage you to check out "The LCMS Response To Planned Parenthood (And How We Lutherans Should Respond To Abortion)" and all the links I embedded throughout that one. Bottom line, as despicable and sad a decision as this is by the SCOTUS (as is the concerted response from the pro-abortion/pro-choice crowd), all hope is not lost. I like what Rev. Hans Fiene pointed out several months ago when he observed that we've seen the end of the abortion moderates, and that's actually a good thing in the long-run. Perhaps this is as good a time as any to share the prayer that the Lutheran Church-Missouri Synod (LCMS) issued today in response to this ruling. The Lutheran Church—Missouri Synod President Rev. Dr. Matthew C. Harrison issued the following comment today on the Supreme Court’s striking down Texas regulations protecting the health and safety of expectant mothers and their unborn babies. "The lie is the death of man, his temporal and his eternal death. The lie kills nations. Through their lies, the most powerful empires of the world were laid waste. History knows of no more unsettling spectacle than the judgment which comes to pass when the men of an advanced culture have rejected the truth, and are now swallowed up in a sea of lies. As was the case with fading pagan antiquity, where this happened, religion and law, poetry and philosophy, life in marriage and family, in the state and society, in short, one sphere of life after another, fell sacrifice to the power and curse of the lie. Where man can no longer bear the truth, he cannot live without the lie. Where man, even when dying, lies to himself and others, the terrible dissolution of his culture is held up as a glorious ascent, and decline is viewed as an advance, the like of which has never been experienced." Union and Confession, 1936. 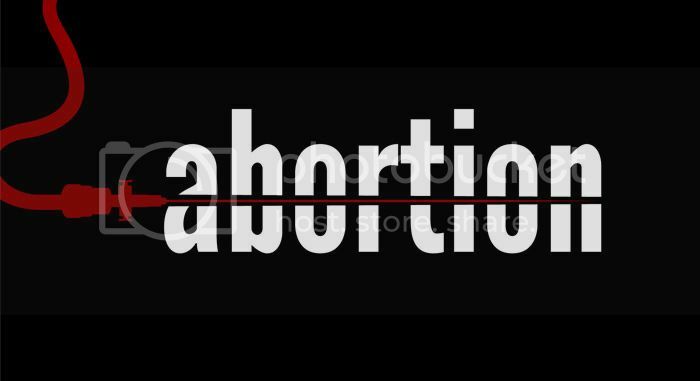 Friends, despite what you may have heard (or what you might even think), God's grace is certainly available to the Abortionist, the Planned Parenthood Employee, and the Woman Who Has Had An Abortion. His forgiveness is freely available to them all (to all of mankind!) through repentance of their sins and faith in His Son, our Lord and Savior, Jesus Christ, whose death and resurrection covers all sin, even murder. In a Lutheran layman's terms, let's pray that our Lord would bring an end to abortion and help us to always make a good confession of the truth that's always pro-life.